James Joyce’s novel Ulysses is set on the 16th June 1904 and has become known as Bloomsday, after the book’s anti-hero Leopold Bloom. Both he and Stephen Dedalus journey across Dublin, experiencing all of life in one day. Meanwhile, Bloom’s wife Molly is in bed entertaining man-about-town Blazes Boylan. Here are our top 5 tips to celebrate Bloomsday across the world. Start off by having a swim in the scrotum tightening sea or some other watering hole like stately plump Buck Mulligan, friend of Stephen Dedalus, to rouse you for your Ulyssean adventure. For afterwards, arrange a Bloomsday breakfast with friends or family. Your menu could have either burnt kidneys (famously Leopold Bloom ate with relish the inner organs of beasts and fowls) or eggs, tea, toast and honey like Stephen Dedalus or use your powers of seduction to convince someone to bring you tea and toast in bed, like Molly Bloom. Bloomsday gives you a perfect excuse to dress up as an Edwardian lady or gent for the day. Dressing up is always lots of fun and makes you feel part of the Bloomsday carnival. For the ladies, wear a long skirt with blouse and jacket. Decorate a hat with ribbons or flowers and remember your parasol to maintain a pale complexion. For the men, don striped jackets or black three-piece suits and adorn your neck with a bowtie. Accessorise with spectacles, a walking stick and a yellow flower in your lapel. A bowler hat or boater will finish off the look. Pepper your conversation with your favourite Ulysses quotes as you walk into town. For extra luck, carry a black potato in your pocket as Bloom does in Ulysses. Much of Ulysses takes place around the city centre. Walk through a busy part of town and observe your surroundings with fresh eyes. Feed the seagulls or other feathered friends along the way before paying a visit to the local pub for a gorgonzola cheese sandwich washed down with a glass (or two) of burgundy wine. Alternatively, have your own picnic in a nearby park and write a stream of consciousness about what you see, smell, hear and taste. Afterwards pop into the local museum or library like Bloom does for a little cultural distraction. If you are feeling adventurous, read a section of Ulysses aloud in an Irish accent with some like-minded Joyce fans over a mix of drinks. When one reads these strange pages of one long gone one feels that one is at one with one who once – James Joyce. Wander through the streets of town for some improper thoughts and nighttime adventures. Take turns to tell tall tales over cold coffee and stale buns as Bloom and Stephen do when they listen to a drunken sailor. As you wander home from your Ulyssean adventure gaze at the heaventree of stars hung with humid nightblue fruit and contemplate life on this spinning ball. Then sip some hot cocoa before hopping into bed with a loved one. 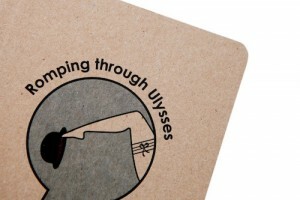 Or get yourself a copy of Romping through Ulysses, our illustrated pocket guide, which gives you ideas on things to do, what to wear and is packed with insider titbits and the best quotes from Ulysses. Romping through Ulysses by At it Again! Bloomsday, Dublin Trip, Events, Irish Writers, James Joyce, Ulysses Bloomsday, Event, Irish Literature, James Joyce, Leopold Bloom, Stephen Dedalus, Ulysses. permalink.